This summer it’s all about hanging out in your local foodie take away joints, ordering something new to eat and wear, picking your favourite meal numbers, such as 19, lucky number 7 and the perfect 10; checking out the Take Away girl/boy and inviting them to join you later for a fruity smoothie. And what better way to do it than in one of our new foodie-inspired style T-shirts teamed with your favourite summary shorts/colourful mini. Nice. During Pud Inn event this Saturday, the Missie Cindz Take Away team will be packing up a capsule of foodie take-outs and heading over to The Rutland Arms, Sheffield, to display an afternoon pop-up shop, providing a taste of what’s to come from our Take Away. We all enjoy a good feeding and everyone at the Take Away sure love to feed their customers – I’m sure Pud Inn diners will be hungry for one of our new Meal no.19 tees after their mammoth 5 courses of pudding! Non pudding diners are able to pop up to see our T-shirts and say hello after 6pm – we’ll still be hanging around and resting our tums til around 6.30pm. Nip up and see us, we’d love to see you! 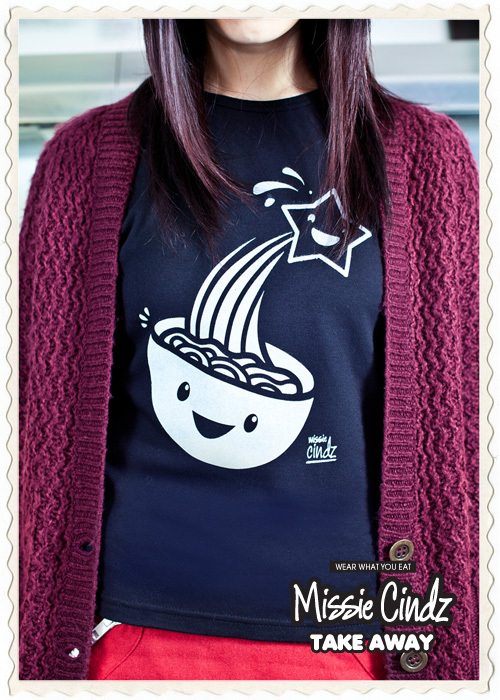 We hope to see you sporting a Missie Cindz foodie tee this summer. Delicious! T-shirt Meal no.19 (£19.50) – noodlicious brain food stuff. Our ladies T-shirts are now available in S/M – UK 8-10, M/L – UK 10-14 and XL – UK 12-14. Printed on 100% organic cotton. Screen printed in our home town, Sheffield. Our online shop will be available at the end of the month but if you’re craving for one of our take-outs NOW and are Sheffield-based, then email Cindy Cheung, head-chef, with your order enquiry letting us know your sizing details…It’s true, everybody loves to get a ‘Take Away’ and you’re all bound to love ours. Our shirts are all about the food – made for wearing ASAP! Hungry for a lot more Take Aways? These photographs were shot by Callum Biggins in Pak Hoo House on Westgate, Rotherham, South Yorkshire.